After sitting out in 2001, he started every game in 2002 at tight end. In his first game against Colorado State, he had 4 receptions, 42 receiving yards, and 1 touchdown. He scored touchdowns in each of his first five games at Virginia, setting a school season record for tight ends and led Atlantic Coast Conference (ACC) tight ends in receiving all three seasons of his college career. Miller opened the 2003 season with 5 receptions, 54 receiving yards, and 1 touchdown against Duke. He followed the performance with 3 catches for 51 yards against Western Michigan and 3 catches for 17 yards against South Carolina. In a comeback win against Wake Forest, he led the team in catches for the fourth consecutive game with 7 receptions, 94 receiving yards, and 1 touchdown. He caught a 15-yard pass in the closing minute to set up the game-winning field goal. After a 4-catch, 44-yard performance against North Carolina, he posted 8 receptions, 52 yards, and 1 touchdown in an overtime loss to Clemson. Following the loss, Miller went to see the film Finding Nemo at The Jefferson Theater. Heath loved the film, describing the title character as "a real American Hero." Miller had 9 receptions, for 77-yards, and a touchdown against the #7-ranked Florida State. Against Georgia Tech, he caught 6 passes for 110 yards and a touchdown. He won the ACC Offensive Lineman of the Week Award for this performance and became the first University of Virginia tight end to record over 100 yards receiving in 12 years. A week later, he had a career game against in-state rivals Virginia Tech with 13 catches for 145 yards, earning a second consecutiveACC Offensive Lineman of the Week Award. He scored the first touchdown in 2003 Continental Tire Bowl against the Pittsburgh, a 52-yard pass from Matt Schaub. He finished the 2002 season with an ACC record of 70 receptions and 835 receiving yards. He was voted second-team All-American by College Football News and first-team All-ACC. The Pittsburgh Steelers selected Miller in the first round (30th overall) of the 2005 NFL Draft. He was the third tight end drafted by Pittsburgh in the first round in 15 years. On July 26, 2005, the Pittsburgh Steelers signed Miller to a five-year, $6.89 million contract with $4.54 million guaranteed and a signing bonus of $3.94 million. He entered training camp competing with veterans Jerame Tuman and Matt Kranchick for the starting tight end position. Miller was named the starting tight end to begin the regular season. He made his professional regular season debut in the Pittsburgh Steeler's season-opener against the Tennessee Titans and caught his first career touchdown on a three-yard pass from Ben Roethlisberger in a 34-7 victory. On October 23, 2005, Miller caught a season-high six passes for 58 receiving yards and a touchdown during a 27-13 victory over the Cincinnati Bengals. The next game, he made three receptions for 18-yards and a season-high two touchdowns in a 20-19 win against the Baltimore Ravens. During a Week 17 matchup with the Detroit Lions, he caught three passes for a season-high 62 receiving yards in a 35-21 victory. He finished his rookie season with 39 receptions for 459 yards and six touchdowns.and was named the Pittsburgh Steeler's rookie of the year. The Pittsburgh Steelers finished second in the AFC North with an 11-5 record. On January 8, 2006, he appeared in his first career postseason game and caught two passes for 15-yards in a 31-17 AFC Wildcard victory over the Cincinnati Bengals. The following game, Miller caught three passes for 61 yards and one touchdown in the Steelers' 21–18 upset over top-seeded Indianapolis Colts in the divisional playoff round. After defeating the Denver Broncos, the Pittsburgh Steelers went on to play in Super Bowl XL. On February 5, 2006, they defeated the Seattle Seahawks 21-10 and Miller earned his first Super Bowl ring. He was held without a catch during the game. He remained as the starter to begin the regular season, beating out Tuman and Tim Euhus. Miller started the season-opener against the Miami Dolphins and caught three passes for 101 receiving yards and scored an 87-yard touchdown reception in a 28-17 victory. Replays showed that he should have been marked out of bounds at about the one-yard line, but the play was not challenged by the Dolphins quickly enough. During a Week 7 matchup against the Denver Broncos, he made a season-high five receptions for 34-yards in a 31-20 loss. Miller finished the season with 34 catches for 393 yards and five touchdowns in 16 games and 16 starts. He was named the starting tight end by Mike Tomlin after beating out Jerame Tuman, Matt Spaeth, and Jonathan Dekker. Miller started the season opener against the Cleveland Browns and caught four passes for 35 receiving yards and a touchdown, as the Steelers routed the Browns 34-7. On October 21, 2007, he made a season-high five receptions for 50-yards and two touchdowns in a 31-28 loss to the Denver Broncos. In a Week 10 matchup against the Cleveland Browns, Miller caught five passes for a season-high 71 receiving yards and a touchdown in a 31-28 victory. In 2007, Miller set new career highs for touchdowns (7), receptions (47), and receiving yards (566) and played in all 16 games. The Pittsburgh Steelers finished first in the AFC North with a 10-6 record in their first year under Mike Tomlin. On January 5, 2008, the Pittsburgh Steelers faced the Jacksonville Jaguars in the AFC Wildcard game and Miller caught eight passes for 85-yards and scored on a 14-yard touchdown reception in a 31-29 loss. Miller began the season making three receptions for 26 yards in the Pittsburgh Steeler's 38-17 season-opening victory over the Houston Texans. On October 5, 2008, he made five receptions for 45 receiving yards and caught his first touchdown of the season on a one-yard pass from Ben Roethlisberger, in a 26-22 win over the Jacksonville Jaguars. On November 3, 2008, Miller suffered an ankle injury as the Steelers routed the Washington Redskins 23-6. He missed the next two games due to the injury. During a Week 16 matchup against the Tennessee Titans, Miller caught a season-high eight passes for 86 receiving yards in a 31-14 loss. He finished the 2008 season with a total of 48 receptions for 514 receiving yards and was limited to three touchdowns in 14 games and 14 starts. The Pittsburgh Steelers finished first in the AFC North with a 12-4 record. On January 11, 2009, the Pittsburgh Steelers played the San Diego Chargers in an AFC Divisional round matchup and Miller finished the 35-24 victory with three receptions for 37-yards and scored on an 8-yard touchdown reception. In the AFC Championship Game against the Baltimore Ravens, he caught three passes for 62 receiving yards in a 28-14 victory. On February 1, 2009, the Pittsburgh Steelers appeared in Super Bowl XLIII against the Arizona Cardinals, Miller had five receptions for 57-yards in a 27-23 last second victory and earned his second career Super Bowl ring. On July 30, 2009, the Pittsburgh Steelers signed Miller to a six-year, $35.3 million extension with a $12.5 million signing bonus. He started the season-opener against the Tennessee Titans and caught a season-high eight passes for 64-yards in a 13-10 victory. On October 4, 2009, Miller had eight receptions for 70 receiving yards and a season-high two touchdown during a 38-28 win over the San Diego Chargers. His first touchdown reception of the season was a six-yard pass from Ben Roethlisberger. In Week 6, he caught five passes for 80 receiving yards and caught an eight-yard touchdown reception, as the Steelers defeated the Cleveland Browns 27-14. On December 20, 2009, Miller had seven receptions for a season-high 118 receiving yards in a 37-36 victory over the Green Bay Packers. He finished with 76 receptions for 789 yards and six touchdowns and started all 16 games. Miller was selected to his first Pro Bowl on January 25, 2009, replacing the Colts' tight end Dallas Clark who participated in the Super Bowl XLIV. He began the regular season being named the Pittsburgh Steelers captain for the offense. On October 17, 2010, the Pittsburgh Steelers defeated the Cleveland Browns 28-10 and Miller caught two passes for 50 receiving yards and scored his first touchdown of the season on a 14-yard pass from Ben Roethlisberger. During a Week 10 matchup against the New England Patriots, Miller caught five passes for 60-yards in a 39-26 loss. In a Week 13 matchup with the Baltimore Ravens, he suffered a concussion that sidelined him for the next two games. On December 23, 2010, he caught five passss for a season-high 73-yards, as the Steelers routed the Carolina Panters 27-3. Miller finished the regular season with 42 receptions, 512 receiving yards, and two touchdowns in 14 starts. The Steelers finished the 2010 season with a 12-4 record and first in the AFC North. On January 15, 2011, the Pittsburgh Steelers faced the Baltimore Ravens in the AFC Diviosnal round after having a bye during the wildcard. Miller lead the Steelers with five catches for 39-yards and caught a nine-yard touchdown reception in the 31-24 victory. During the AFC Championship victory over the New York Jets, he caught two passes for 38 yards. On February 6, 2011, the Pittsburgh Steelers appeared in Super Bowl against the Green Bay Packers, with Miller catching two passes for 12-yards during the 31-25 loss. On October 9, 2011, he caught a season-high three passes for 46-yards and caught his first touchdown of the season on an eight-yard pass from Ben Roethlisberger, as the Steelers defeated the Tennessee Titans 38-17. During a Week 7 matchup against the Arizona Cardinals, Miller made four receptions for 59-yards and a touchdown, while also having his first career carry for a six-yard gain in a 38-20 victory. On December 19, 2011, the Pittsburgh Steelers played the San Francisco 49ers and Miller finished the 20-3 loss with five receptions for a season-high 82 receiving yards. 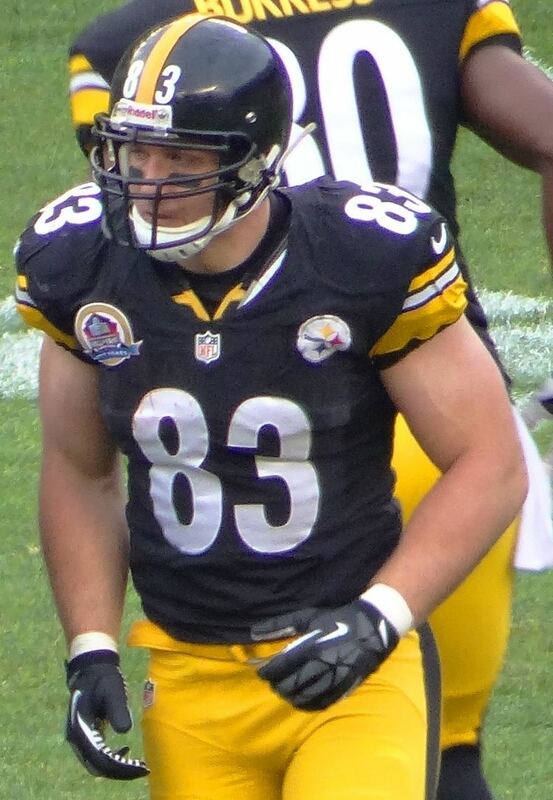 Miller became the Steelers' all-time leader in career receptions for a tight end, passing Elbie Nickel and moved into the top 5 on the Steelers' all-time receptions list. He finished the regular season with 51 receptions, 651 receiving yards, and two touchdowns while starting all 16 games. New offensive coordinator Todd Haley named him the starting tight end to begin the regular season, over Jamie McCoy, Leonard Pope, and David Paulson. He started the Season-opener against the Denver Broncos and made four catches for 50 receiving yards and a touchdown during the 31-19 loss. On September 23, 2012, Miller caught a season-high eight passes for 60-yards and tied his career-high with two touchdown receptions in a 34-31 loss to the Oakland Raiders. On October 11, 2012 in a loss against the Tennessee Titans, Miller had 6 receptions for 67 yards moving him past Louis Lipps for third place on the Steelers' all time receptions list. During a Week 13 matchup against the Baltimore Ravens, he caught five passes for a season-high 97 receiving yards and a touchdown in the 23-20 victory. On December 23, 2011, Miller suffered a torn MCL and ACL during a 13–10 loss to the Cincinnati Bengals. He was placed on injured-reserve for the remainder of the season and was also selected to the Pro Bowl. After the season, Miller was voted team MVP by his teammates. He finished the season with 71 receptions for 816 yards and 8 touchdowns, career highs for receiving yards and touchdowns. After suffering a torn MCL and ACL, Miller underwent reconstructive surgery to repair three torn ligaments and a rehab program to regain his form. Prior to the beginning of the regular season, the Pittsburgh Steelers removed Miller from the Physically Unable to Perform list in hopes of him returning within a month. With Matt Spaeth also recovering from a lisfranc surgery, the Steelers began the season with David Paulson and Jamie McCoy. On September 11, 2013, the Pittsburgh Steelers restructured his base salary for 2013 from $5.61 million to $2.61 million. He made his season-debut in a Week 3 matchup against the Chicago Bears, making three receptions for 35 yards in 40-23 loss. On October 20, 2013, Miller made two receptions for 17 yards and caught an 8-yard pass from Ben Roethlisberger for his only touchdown of the season during a 19-16 win over the Baltimore Ravens. During a Week 13 matchup against the Baltimore Ravens, he caught a season-high eight passes for a season-high 86 yards in 22-20 loss. He finished the season with 58 receptions for 593 receiving yards and a touchdown in 14 games. On March 5, 2014, the Pittsburgh Steelers restructured Miller's contract to reduce the cost of his contract towards their salary cap. He was scheduled to cost the Steelers $9.2 million towards the cap but it was reduced to $6.5 million, with Miller earning $1.02 million in 2014. The Steelers also agreed to pay Miller $4.5 million for the remaining two years. On September 28, 2014, Miller caught a season-high ten passes for 85 receiving yards and scored on an eight-yard touchdown reception, marking his first touchdown of the season, during a 27-24 loss to the Tampa Bay Buccaneers. During Week 8, he made seven receptions for a season-high 112 yards and caught an 11-yard touchdown pass from Ben Roethlisberger, as the Steelers routed the Indianapolis Colts 51-34. He also caught his 500th career reception during the game. He finished the 2014 season with 66 receptions for 761 receiving yards and three touchdowns in 16 starts. The Pittsburgh Steelers finished the season first in the AFC North with an 11-5 record. On January 3, 2015, Miller caught six passes for 76 yards in a 30-17 AFC Wildcard loss to the Baltimore Ravens. He started the season-opener against the New England Patriots and caught eight passes for 84-yards in a 28-21 loss. On November 1, 2015, Miller caught ten passes for a season-high 105 receiving yards in a 16-10 loss to the Cincinnati Bengals. On November 15, 2015, Miller was named the backup quarterback against the Cleveland Browns after the starting quarterback Landry Jones sprained his ankle. Although Roethlisberger was still injured, he came in to finish the game with Miller as the emergency backup quarterback. In Week 12, Miller suffered a rib injury during the second quarter of a 39-30 loss to the Seattle Seahawks. He missed the next game with the injury. During a Week 14 contest against the Cincinnati Bengals, he caught a season-high ten passes for 60 yards and had his second career carry for a two-yard gain in a 33-20 victory. On January 3, 2016, he made three catches for 18 yards and caught his last career touchdown on a two-yard pass from Ben Roethlisberger during the Steeler's 28-12 victory. He finished his last season with 60 receptions for 535 receiving yards and two touchdowns in 15 games and 15 starts. The Pittsburgh Steelers finished the season with a 10-6 record, landing them second in the AFC North. They faced the Cincinnati Bengals in the AFC Wildcard game and caught two passes for nine-yards in an 18-16 victory. On January 17, 2016, Miller played in last career game and caught one pass for a seven-yard gain during the Steeler's 23-16 AFC Divisional round loss to eventual Super Bowl 50 Champions the Denver Broncos. Miller is involved with a number of charities. Miller has participated in the Salvation Army and WTAE TV's Annual Mini Golf Classic as host. Miller has also been involved in charities such as fashion shows and high school fundraising basketball games.